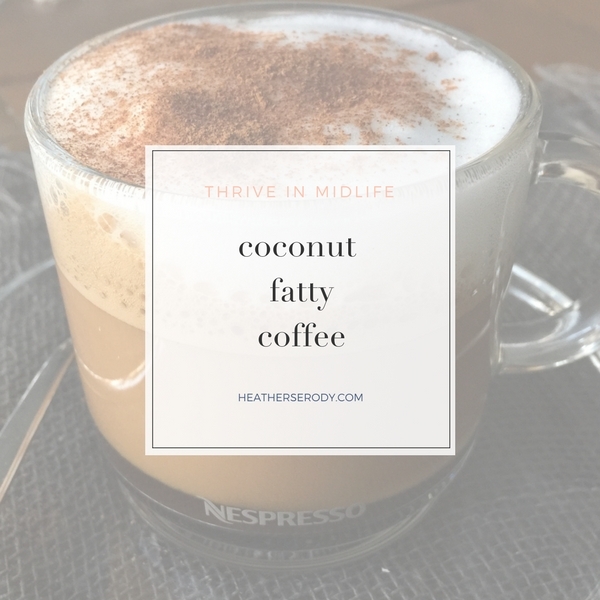 Making keto coffee with added coconut or MCT oil is a nice way to access near-instant energy along with the benefits of caffeine to fuel up for an early morning workout or run. If you don't need the extra calories & fuel that coconut fatty coffee provides, then just make a basic keto coffee. I pour about 2 Tbs. of full-fat organic heavy cream or half & half in small microwave-safe bowl and microwave for about 30 seconds and then froth it with a handheld frother. Set aside. Brew a Nespresso espresso ‘luongo' (large shot) or however you make your coffee into a mug. Add 1/2 TBS of organic virgin coconut oil to your hot coffee if you are going to have 2 cups of coffee or a full tablespoon if you're just having one. If you don't like the taste of coconut oil, then substitute a good quality MCT oil. If you like sweetness then add 5-10 drops of your favorite all natural liquid stevia. I'm totally addicted to the English toffee flavor, but there are a bunch of different flavors to choose from. Use your handheld frother to emulsify the coconut oil, coffee, & stevia together until it's emulsified. Pour the frothed cream/half & half over top and sprinkle with cinnamon or cacao powder if desired. p.s. don't overdo the coconut or MCT oil as this can cause gastric distress. p.p.s. which keto coffee is right for you? Ninja Goat Nutritionals makes a product called fatCoffee, which is a quick and easy way to make butter coffee anywhere, anytime – and it’s made with 100% grass-fed butter, organic coconut oil, and MCT oil. Would you be willing to try fatCoffee, and let me know what you think about it? I’d be happy to provide a sample, if you can send me a mailing address. Thanks for your time, and I hope to hear from you soon.